Billy the Kid biography will posted soon! 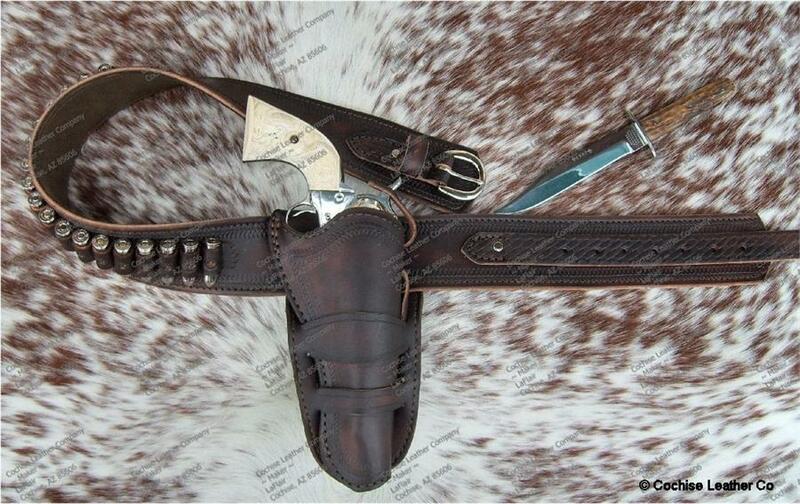 This style of gunbelt came about after the turn of the century and is known as the Half-Breed style. The Half-Breed rig has a modified back flap holster design. This created a very comfortable and practical gunbelt that positioned the holster and gun on the hip which was popular with just about anyone that wore a six-gun including lawmen, cowboys and outlaws. The Half-Breed style is transitional between The Mexican Loop and The Buscadero rigs. Our Billy the Kid holster is made of two pieces of 4-5 oz. leather, laminated nap-sides together so the smooth side is out. This process gives the holster more strength and durability. The gunbelt is made of 9-10 oz. leather with smooth smooth leather lining. The entire rig is has nylon stitching for durability and comes with either a brass or silver buckle.